Basically, the two leading candidates are fairly close policy-wise. What sealed the deal for me to break for Moran was the way Mike Shanin and Scott Parks of KMBZ felt of the way the candidates handled themselves while being interviewed on their program. With Moran and Tihart running for the senate seat, and Dennis Moore deciding not to run for office again, Lynn Jenkins was the only incumbent house member running for the seat they held during the current congress. Dennis Pyle ran on a campaign indicating that Lynn was not conservative enough. Senator Brownback is, of course, the front-running candidate overall in the current race for govenor. In reality, whoever I vote for in this race didn’t makea difference. Something tells me the incumbent, Democrat Steven Six, will get elected for a full term, especially after the controversy with the two previous AG candidates. Free Pass to November – Mr. Estes ran unopposed on the Republican Primary. Haven’t seen much debate on this one. On Memorial Day, I took a road trip to explore a couple of roundabouts, as well as parts of the new US 69 freeway in Linn County. 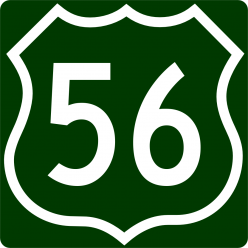 As a Consequence of my raodtrip, I’ve also updated the US 69 exit guide to reflect the actual signage out in the field (I wasn’t *that* far off regarding the final segment of the freeway between Fort Scott and Kansas City. I also added a conceptual exit numbering scheme… the new 2009 Manual on Uniform Traffic Control Devices mandates that all major freeways have milepost-based exit numbering. A recent set of comments on a spirit squad related email list reminded me of events that happened 10 years ago this month that brought controversy to the KU spirit squad. In December of 1998, the KU Athletics department decreed that the spirit squads would not be allowed to participate in Nationals. However, the Dance team captain had already made the necessary arrangements to participate at the the ’99 UDA nationals, which by then were about a month away. The elected to ignore the embargo and proceeded as planned, which was publicly posted in the local newspaper. Reaction from the squad was extremely negative. Many of the cheerleaders quit in protest, reducing that squad to 12 by the end of February. The mother of one of the squad members was nice enough to contact me that Saturday night to let me know how they did. I was also able to greet them when they returned to KCI. The dance team was also moved from the floor into a reserved section in the south bleachers. Some of the squad believed it was because they were concealing advertising banners for the local phone company. Toward the end of the season, rumors also persisted that the the south bleachers were going to be turned from student seating to reserved seating. In the end, the coaching staff was dismissed, and the 99-00 dance squad was reduced from two squads of 12 to one squad of 10, with an alternate. The athletic department also sponsored an student support organization called the HAWK club, of which I was a participant. The south bleachers remained student seating, and in fact, the HAWK club was encouraging its members to sit in those south seats. The dance squad was returned to its two squad lineup for the 02-03 season, however, the original name “Crimson Girls” was retired. The new name, “Rock Chalk Dancers,” was introduced in 2004. The squad still anchors the south bleachers while the game is underway, and I doubt they will be moved back to the floor anytime soon. I didn’t mind the name change, partially because the athletics had been promoting the use of blue over crimson, and because I knew there were male dancers out there. In fact, I have a couple of them in my family. I’m also fine with the south end bleachers; that move may have actually saved them from being turned into reserved seating. I haven’t been in contact with the squad personally since the fall of ’03, but thanks to Facebook, I have re-established contact with many of the members of the past squads, including the 98-99 squad. Among that squad, a couple of them are still dancing. I’ve also got a nurse and a dentist. Some are married, a few have kids of their own. Among the worlds of business, academia, and sports, there is one common goal: the pursuit of excellence. Recently, the KU Athletic Department decided that the cheerleaders and Crimson Girls should not be allowed to compete in nationals. Since the spirit squads were willing to raise their own funds, money is not the problem. Therefore, the only plausible reason I could think of is the Athletic Department simply does not want them to go. When it comes to similar spirit groups on the high school level, the Kansas State High School Activities Association is among the most restrictive associations in the country. The Lawrence High and Free State High pom squads and cheerleaders have been invited to national competitions similar to the ones KU have been attending several times. Because of the rules of the KSHSAA, they have not been allowed to go. In addition, the KSHSAA does not allow groups attending summer camps under their name to be ranked, whereas other camps rank their participants on a regular basis. This leads me to believe that the KSHSAA believes that spirit groups should not be competing, a mentality which I suspect has spread to the KU athletic department. Why should the Crimson Girls and the pom squads and cheerleaders of Lawrence be allowed to compete? By competing, they have a brass ring to reach for. If a team succeeds and reaches that ring, they become the mark of excellence. If they try and dont quite make it, they would have my utmost respect for reaching for the top. Not reaching for the top, not really competing, means they have no real passion for what they do and would settle for mediocrity. The Athletic Department and the KSHSAA, whether intentionally or not, are promoting mediocrity by disallowing the spirit squads under their control the opportunity to compete against their peers with little or no reason. Their actions are not good for the students that these organizations are representing because it takes away from their spirit and passion for cheering. Without that passion, their support for the teams they cheer on would be weaker, and that would take away the atmosphere the spirit squads bring to the game they attend.